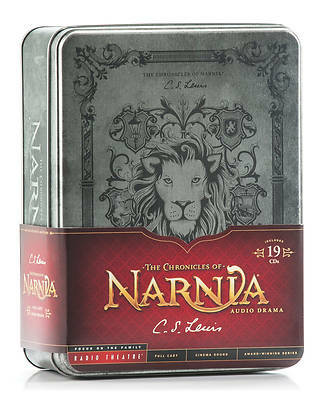 The classic stories of C. S. Lewis's The Chronicles of Narnia come to life through this beautifully boxed edition of fully dramatized audio adventures. Produced by Focus on the Family's acclaimed Radio Theatre, the series is now presented in a collector-quality tin with original artwork and map of Narnia. Recorded in London with an all-star cast of England's brightest talent from the stage and screen, an original orchestral score, and cinema-quality digital sound design, this innovative recording includes all seven original stories and nearly 22 hours of entertainment Adults and children alike will be entranced by stories of courage, self-sacrifice, friendship, and honor--in a world where talking creatures conspire with men, dark forces are bent on conquest, and the great lion Aslan is the only hope. This is a repackaged, collector's edition of this bestselling Radio Theatre resource, which has sold more than 340,000 copies.